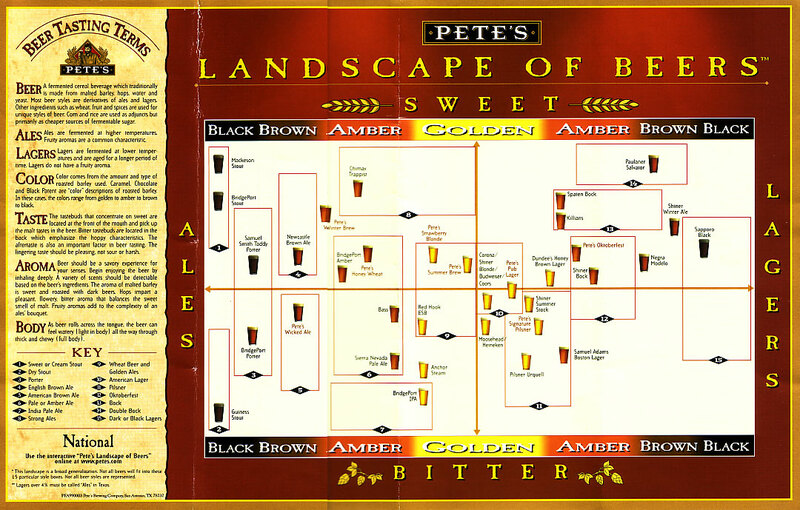 Far in the past, before I was married, when Flash was considered a legitimate programming tool, and perhaps even before Barack Obama was the junior senator from Illinois, a friend of mine introduced me to Pete’s Wicked Ale and the Landscape of Beer. This friend loved (and still loves) to analyze and classify things, and the Landscape was right up his alley. Note the cluster of cheap American beer at the very center of the graph; these are the beers that are so similar to one another as to defy distinction. Also note the giant white space at lower right that covers every hoppy lager from amber through red and brown to black. This is the Great Unknown of the Landscape of Beer, the why-hasn’t-anyone-thought-of-this-before area, the you-should-get-a-brewery-and-make-this-professionally land of promise for homebrewers. And so I set out for this land with high hopes of filling in the blanks. I started with a Brewer’s Best Black IPA kit and added a lager yeast. This resulted in a beer that was absolutely black, but tasted like a mash-up of stout and IPA. This latter flavor was due to an IBU of 80-85 according to the kit instructions, but I didn’t measure it precisely. The alcohol content was a respectable 5.6%. I felt like this was a good starting point; it was a true ale, not a lager (despite the yeast), so it belongs over on the left side of the chart, probably below Guinness Stout. From there it becomes merely a matter of changing the brewing technique to lager the beer instead of merely ferment it, and we’ll see where we are at that point. This entry was posted in Alcohol on April 1, 2014 by Matt Maynard.